The Round Chapel Community Nursery was first opened in 2000 and has supported hundreds of local families in the last 19 years. 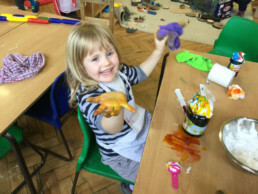 We offer a dependable, friendly, supportive and cosy environment to give young children the opportunity to play and learn together. We have space for up to 20 children in our nursery each day aged between 2 and 5 years old. 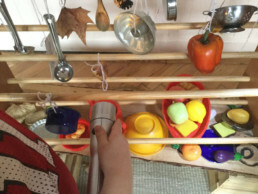 Our days are filled with lots of stories, singing, baking, creative, sensory and small world play incorporating real world objects for heuristic play as well as lots of toys. In the afternoons we are able to offer activities including yoga, storytelling, music, dance and capoeira. We provide the children with breakfast and snacks throughout the day and ask that you provide your own packed lunch. As well as having our lovely light nursery space we are very lucky to have a small garden and a park close by and most days we have an outing to Clapton Square where the children enjoy running around and using the play equipment. If you are interested in your child attending our nursery we welcome parents to come to visit us to see our space and meet our team. Please call Emma our nursery manager on 0208 985 7535 to have a chat and find out more. Emma has been the manager at the Round Chapel Nursery since 2015 but has worked both in the nursery and delivered family activities at the round chapel since 2002. 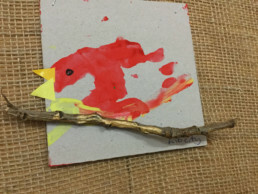 Modina is calm and focussed and enjoys sensory activity development and play and supports children who we are focussing on language development with. Has been a child care practitioner for many years. She has a warm and maternal nature and loves to read to and engage the children with storytelling.